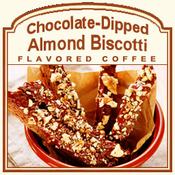 For a decadent treat, try the Chocolate-Dipped Almond Biscotti flavored coffee. If you like to dip biscotti into your coffee, you will love this flavor that already tastes like biscotti. If you do not have biscotti, no worries! No need to make biscotti with this infused-biscotti flavored coffee. With only 2 calories in each cup, this Chocolate-Dipped Almond Biscotti will hit the spot with its rich, chocolate infused 100%, pure Arabica beans. Perfect with its toasty almond undertones, this full-bodied coffee features a crunchy-cookie sweetness. Packaged in a heat-sealed valve bag, this fresh roasted coffee will be roasted and shipped on the same day. 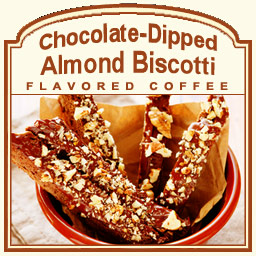 This Chocolate-Dipped Almond Biscotti flavored coffee will offer you a sweetness that will melt in your mouth. Go ahead and dip your favorite kind of biscotti into this Biscotti flavored coffee for double the flavor!